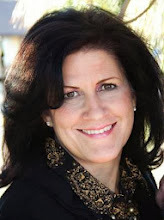 I get so excited about this blog party, and am so happy that Karen Valentine is hosting it once again. 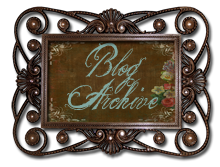 I love to visit all the blogs! My Studio has evolved more since last years visit. It looks a little bit the same, but now the walls are pretty filled up. 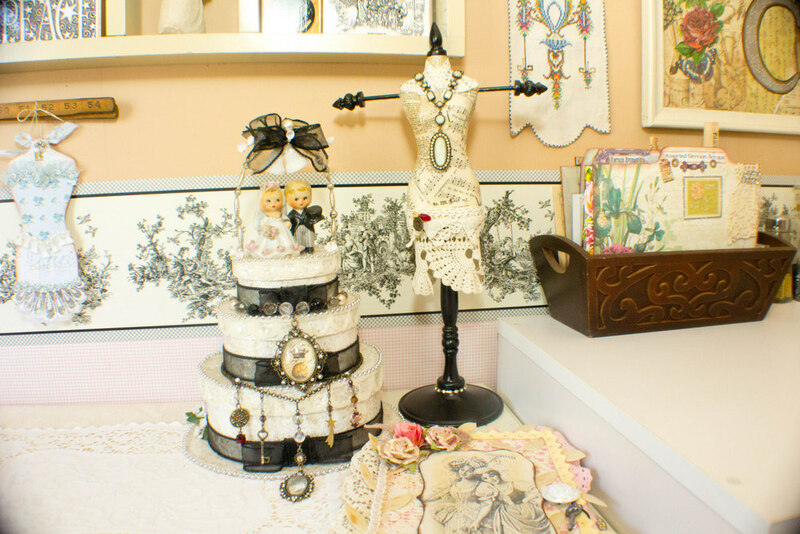 It is not only a crafting studio, with many supplies, but also a place where collections and vintage goodies can be displayed. My favorite place in my home. It is not a large room, but I love spending lots of time in here. There are lots of details and many photos to see here! If you are one of those I have swapped with or won something from, then chances are that you will see some of your handiwork here somewhere. Sit back and enjoy!!! This shelf was one I designed from one I saw in Victoria magazine and had made many years ago, and I was using it to put the children's books on (they didn't fit right anyway) and it was like a light bulb, and I thought why am I not using this in my craft studio. So I took it down one day, repainted it white, and transferred some French writing on it and I am so happy with how it turned out! 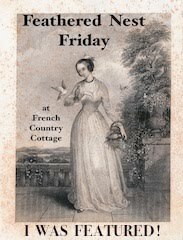 From a French pastry shop sign. 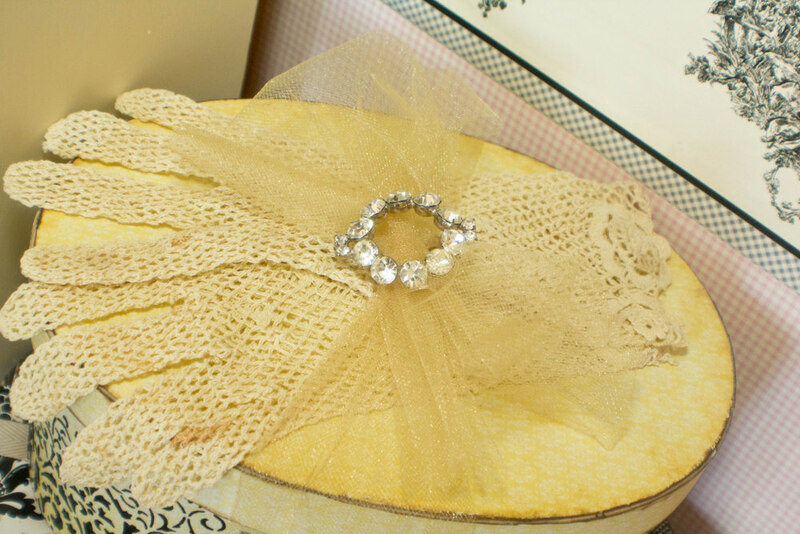 I love this ribbon box as it is just so handy for the most used ribbons. My shelf holds all kinds of wonderful supplies for Vintage Christmas Crafting. Some gifts, some supplies that will be used for something latter. inside a small terrarium, I could not give this one up! I have made so many great blogging friends made through swapping. Kimberly Laws of Art Joy Stuff made this sweet ornament for me. And after painting the knobs that it hangs on, I stamped French writing on them using Staz-on black ink. 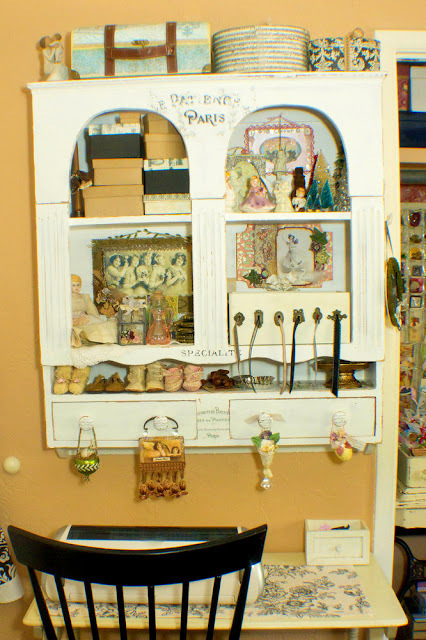 Last year I used these sewing machine drawers for this purpose, but decided to paint them all cream and also the sewing cabinet. 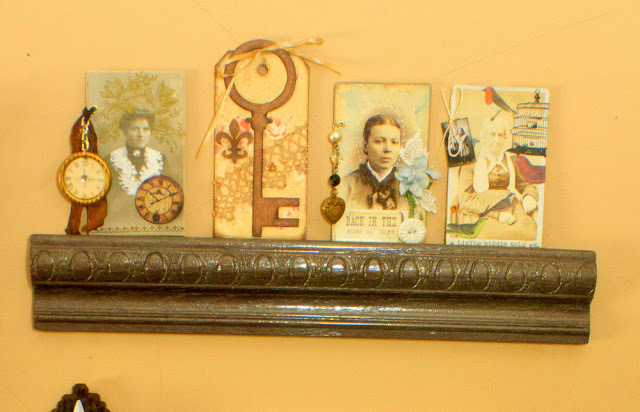 The wall hanging pockets was my mother's and she used it for her jewelry in her closet. I covered the edges with bias tape and hung it on a pole. It holds so many treasures and useful items for embellishing! 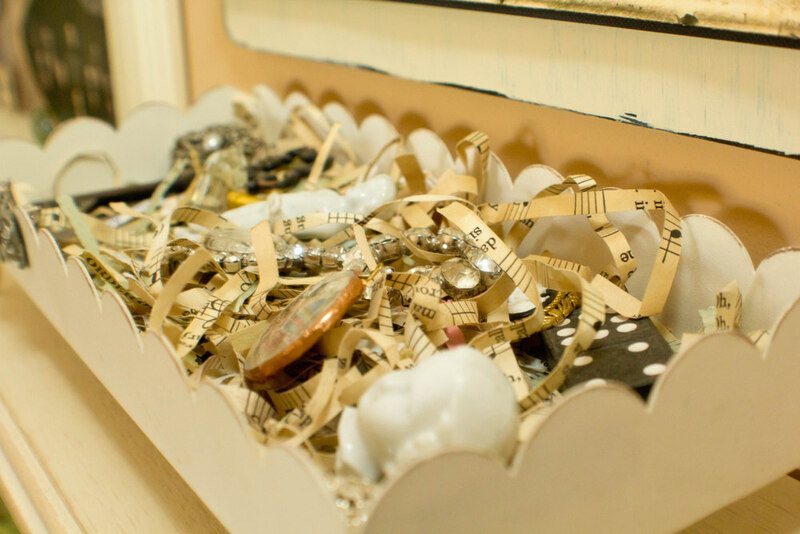 Trims and ribbons, ric racs and bias tapes, twills and fibers, fit perfectly in these sewing drawers. and in front the glass ones with some other special favorites. 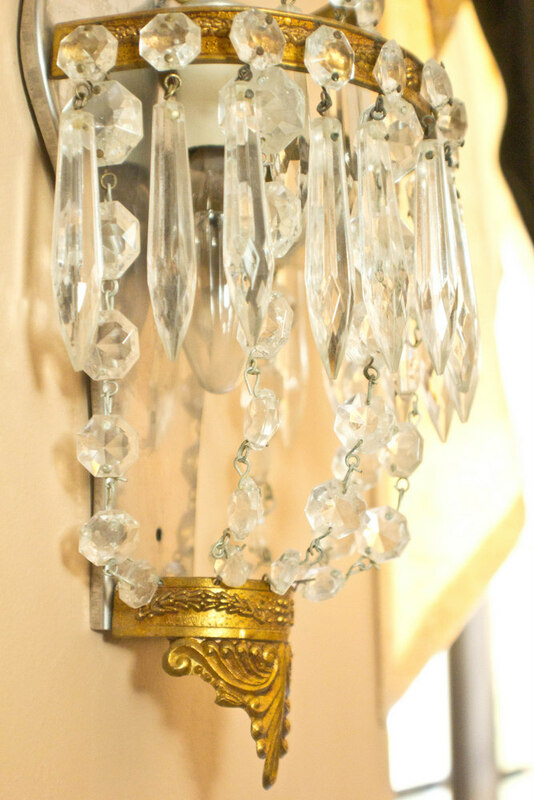 I found this wall sconce for a song at a roadside sale, and bought it for the crystals, and after removing some of the crystals, just had to hang it up! 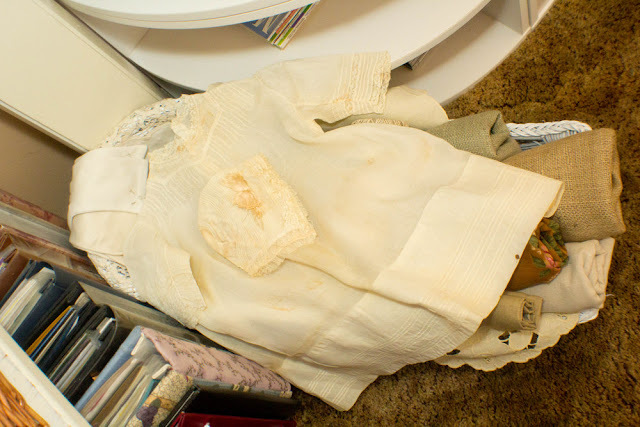 This antique baby dress and bonnet are part of my collection of antique baby clothes. Working on a layout! 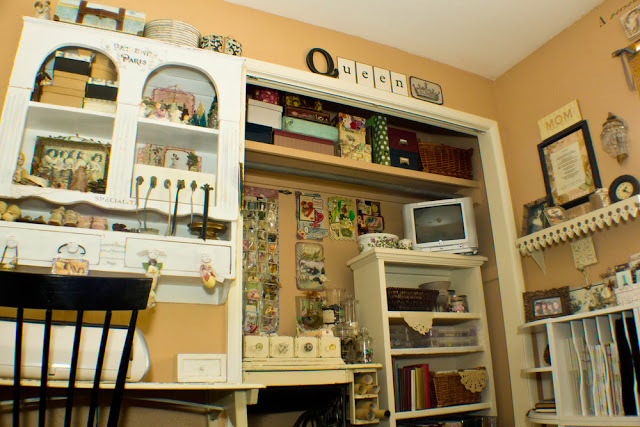 Notice the worn area of the spot I do all the crafting at! I love that! On the window treatment, I hung some chandelier crystals, and underneath there is a battenburg lace piece. From one of my recent matchbox swaps. This one is a favorite. 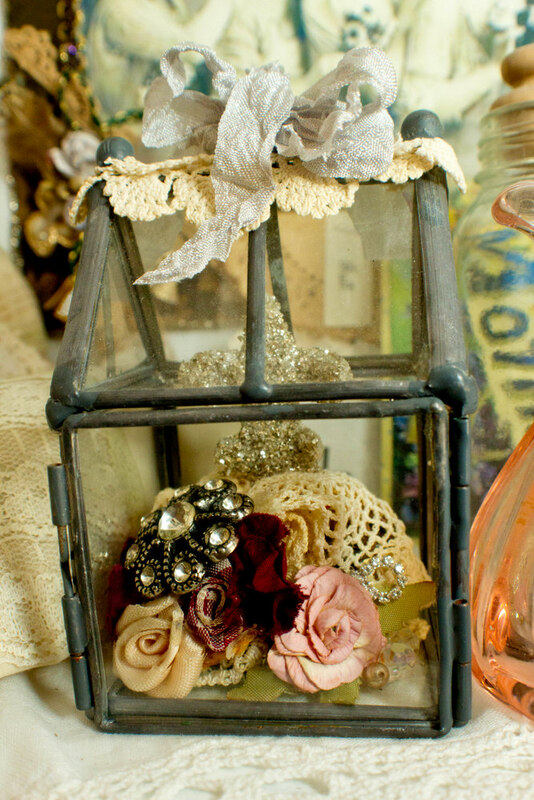 The details are exquisite, and it was made by Deb of Life in my studio You have to check out her darling studio for sure! 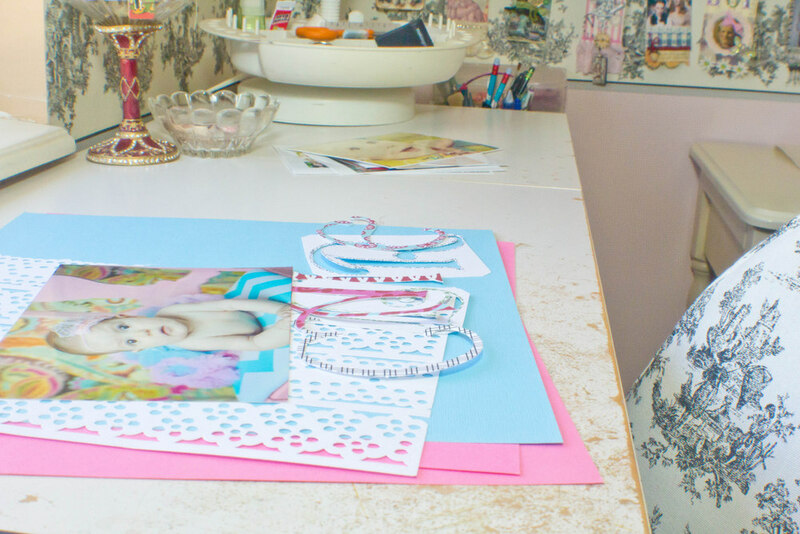 Scrapbooking and cardmaking happen in here as well as designing. 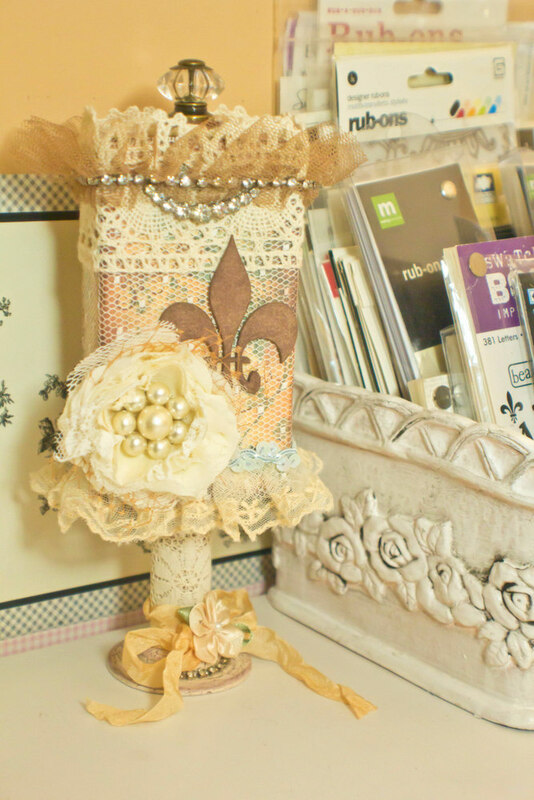 I put my most used embellishments in this table top box right by my cutters. My mica covered wedding cake was a great way to display some new jewelry that I have made. Prima use to only do paper flowers, but they have expanded much more and even to jewelry embellishments. 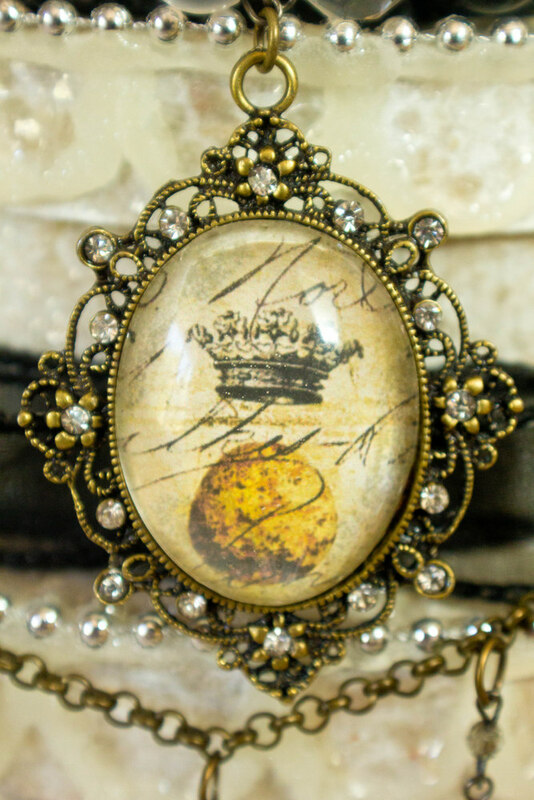 I used the pendant to put a favorite image behind and make a necklace. I have been collecting old salt and sugar shackers and old bottles to house my glitters, micas and micro-beads. I just can't resist a lonely old shaker. Love these vintage labels. I know what is in each one ,but it is fun to use these old labels none-the-less. I just can't resist spreading around a little bit of eye candy here and there. and it is definitely for me and no one else really appreciates it! 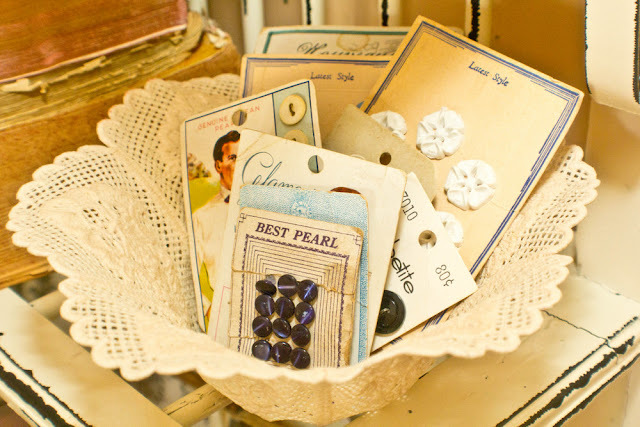 This vintage carpenter's measuring tape is a great place to hang lovely tags, I have created or someone has sent to me. 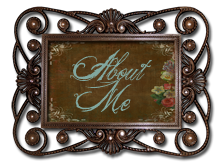 This is the blog journal I created. 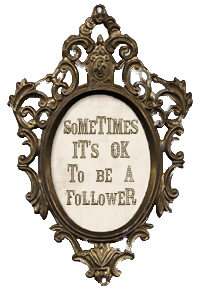 It keeps me in check with all the blog swaps and addresses of blog friends I have. 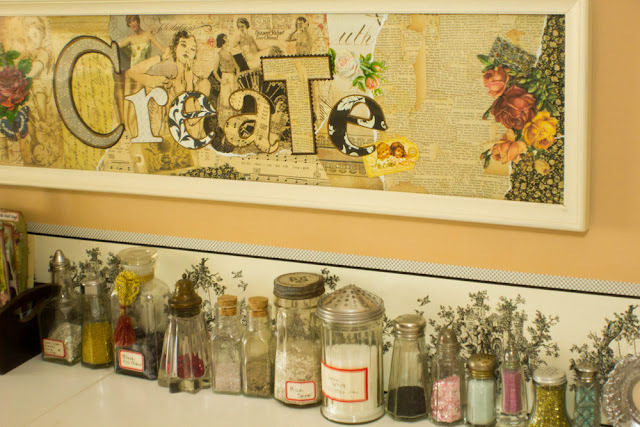 It also was a challenge from Karla of Karla's Cottage to create something and use the "Good stuff"
My tabletop file is handy for storing things like vintage ephemera, Dresden foils, old vintage cards etc. A section of a picture frame makes a nice little shelf for some swapped altered cabinet cards. I also spend lots of time on the floor working so I see this angle a lot of the time. to spruce the display of them up a bit! And the Christmas drawer is my favorite. 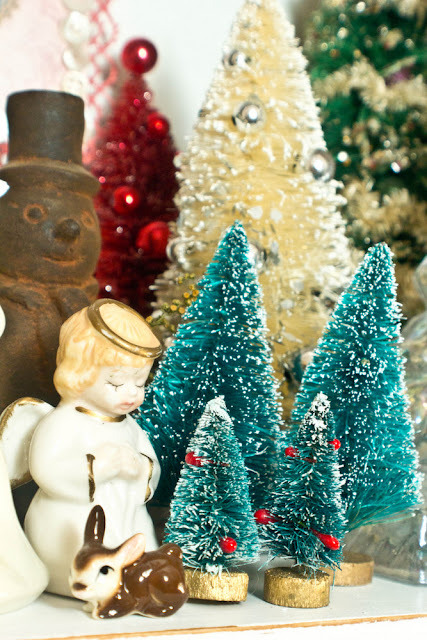 These vintage balls are just waiting for a big bottle brush tree to decorate. The bling is necessary for this studio. Some pillows waiting to be sold. Some are in m Etsy shop. . . . .and others might be someone's gift. 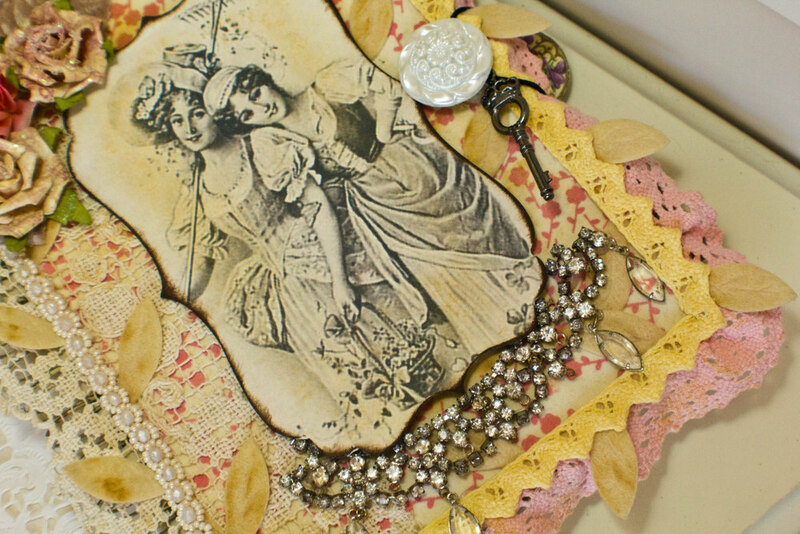 Here is my card that I tack onto my wares that are sold at shows and the Something Special Etsy shop. I'll leave you with the quote on my wall of my studio! Have a great day! Awesome studio!!! Loved visiting you and gathering ideas. Your space is just lovely! I picked up some good storage ideas, too. Thanks for sharing! Fabulous, and loaded with ideas! 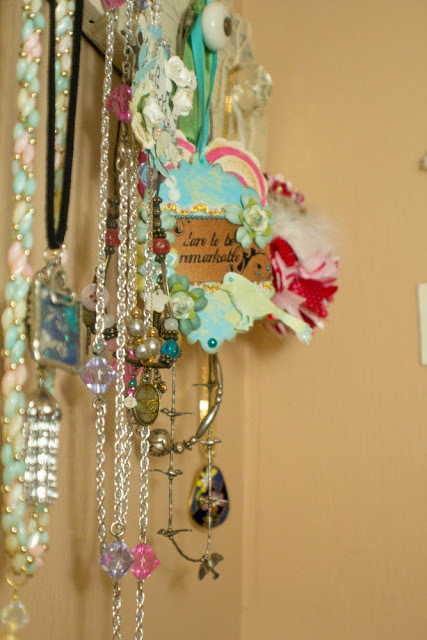 I love Moms jewelry holder...What a dream space! Beautiful, Michelle! Love the color scheme ~ I try to keep to that in my space, too. I love the two work areas you have. Your desk is fantastic with all the space on top and the drawers to store things. 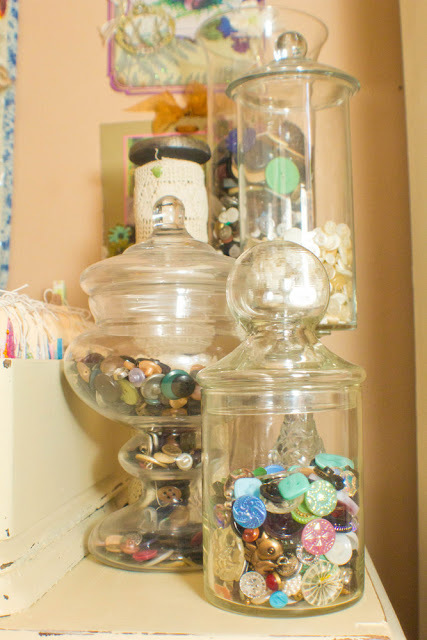 Great way to use things for storage. 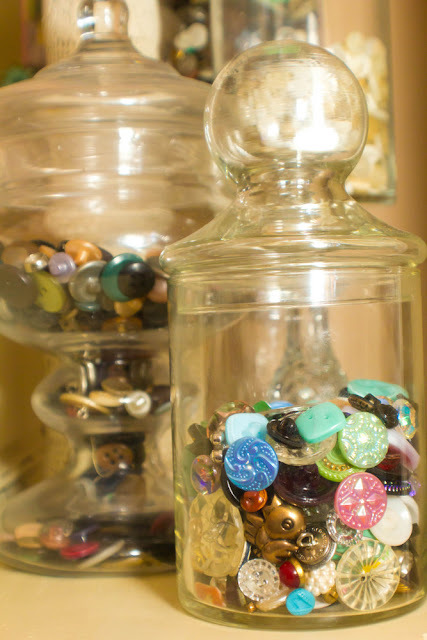 I'm still working on mine as far as jars to hold charms, buttons and game pieces. 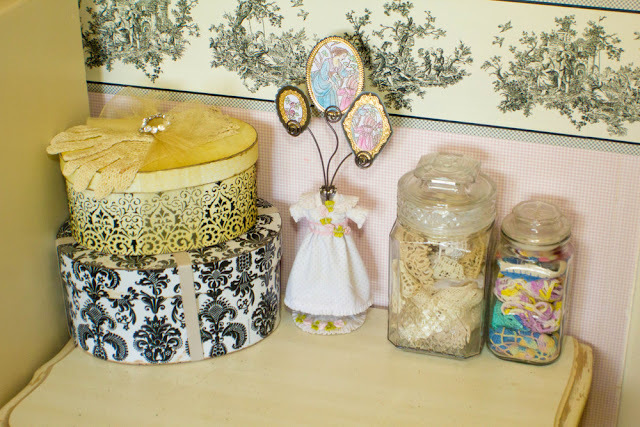 Love that cabinet shelf and your sewing drawers. This is such a great room, I could go on and on! Ooh how lovely!!! Those baby shoes and booties are sooooo sweet! 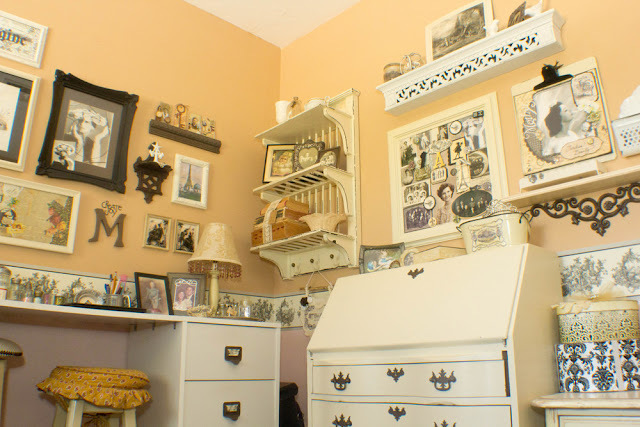 And I LOVE the painted sewing drawers and cabinet...oh how cool...using the drawer spaces to hold the papers and the drawers on top to hold your tags!! I love that idea! I just found myself 4 more drawers to actually use!!! Thanks so much for sharing for the party! Just beautiful Michele! You have so many lovely things and the way you've organized is incredible! You space is absolutely amazingly gorgeous!! Thank you for sharing your inpsiring space! I'm just in love with your space! Sooo wonderful! Oh Michelle! Your space is so, so lovely! I adore it all... you and I have quite similar tastes. What a wonderful place to create your wonderful work!!! I LOVE IT! What a pretty place to create !! Thanks for sharing it all with us. Absolutely LOVE your space. Super cute!!! I really like your window valance. And all the trinkets are just yummy. Thanks for sharing!!! this wonderful trip back through time, must be an incredibly relaxing atmosphere!! 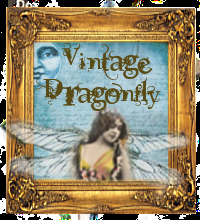 Oh What i would give to be invited her to spend a view hours and create something with you, with all your wonderful vintage goodies! Thank you for sharing your space with us :)!! I love your studio and everything in it. 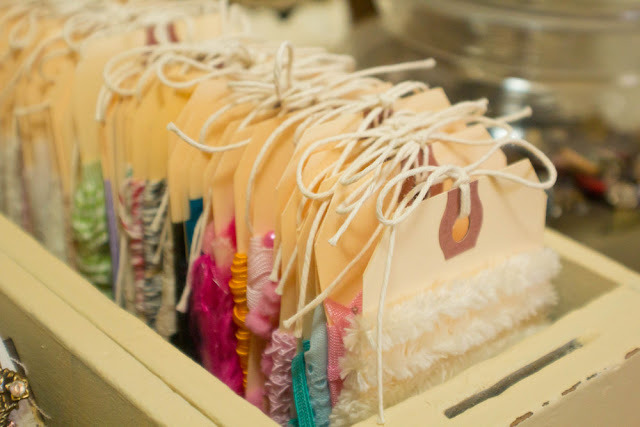 I think I'm going to steal your idea of storing ribbons and trims on the tags displayed in a sewing machine drawer. I love that. Everything is absolutely beautiful! Love your studio! I adore the color of the walls! Filled with so many goodies and chock full of inspiration! Oh Michele, I'd never leave. So many beautiful details, and new ideas for me. 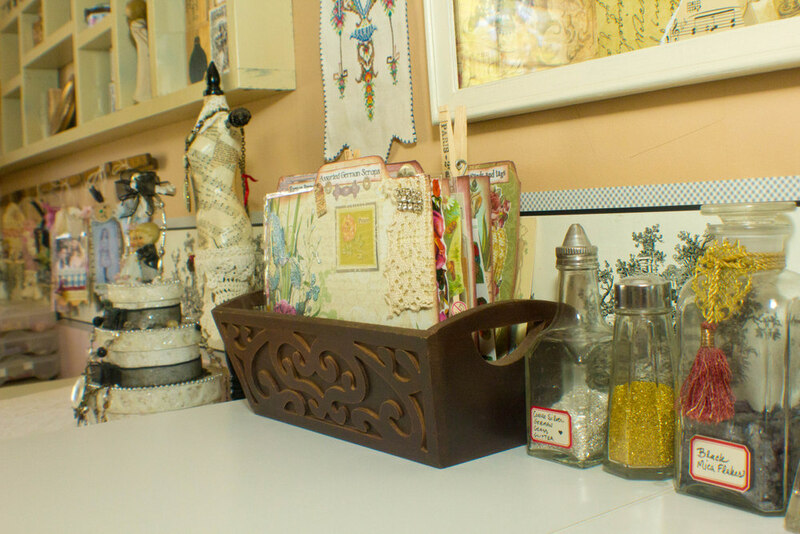 :) I especially love the sewing machine drawers. How do you come across those? Yard sales maybe? 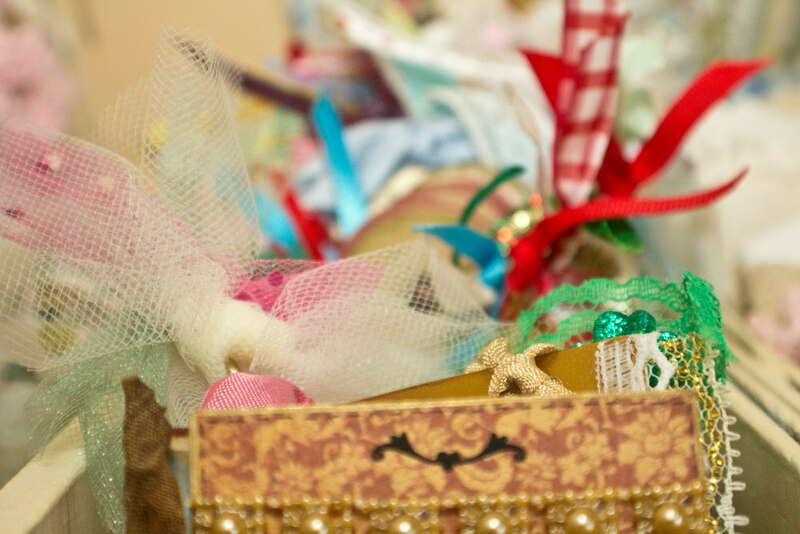 And your ribbon box is perfect. 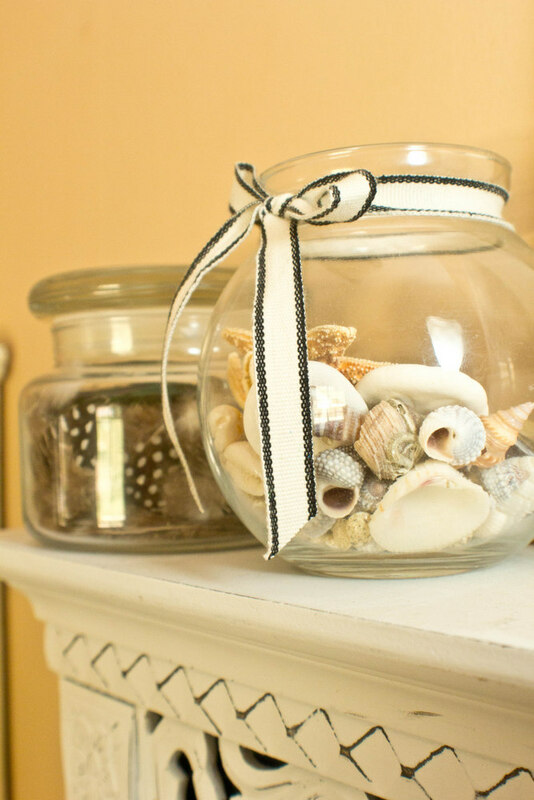 Love your collection of shakers. EEKS!! I want to come play in your room!! Gosh you have the bestest stuff to play with!! I so enjoyed my time spent here and will be back to soak in more inspiration! 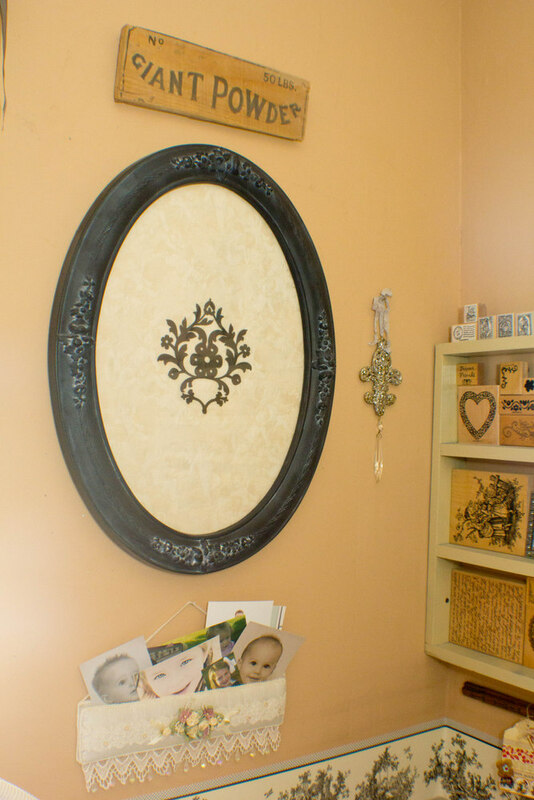 Would love for you to come see my new little space when you have time! A fabulous studio! I will have to visit a couple more times to take it all in. 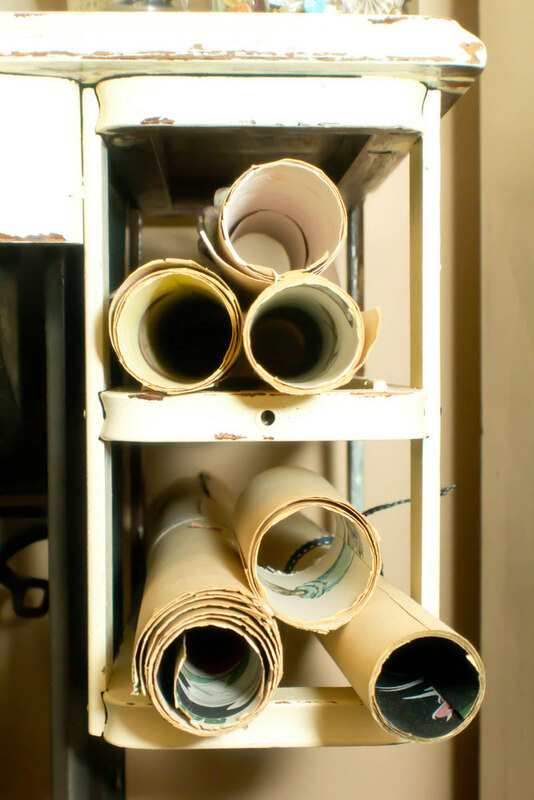 Looking forward to seeing some really special pieces of work from your great studio. Oh that was fun! I love everything..especially the sewing drawers and that wonderfully inspirational CREATE sign you have...what a beautiful collage! thanks for sharing your home studio space. 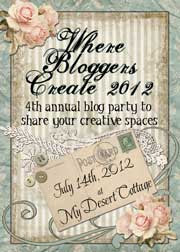 please visit with me too..it's my first year taking part in the blog party and I'm blown away by all the great creative spaces! Awesome. Thanks so much for sharing your space. Everything is so inspiring and encouraging. I'm so glad I got to stop by today. Thanks, too, for visiting my space. beth. Alright already I'm moving in...Can you handle another big child? Just can't wait to come back and visit again...I LOVE EVERYTHING you do, your studio etc. etc. etc. I Live at Zephyr Cove Nevada where is Logandale? I tell ya I'm coming. Everything is wonderful! So pretty - love your wall color. And I appreciate your eye candy very much!! WOW you are right we do have a lot in common with our spaces and I so love yours. I could move right in. Every little detail is pefect surround by your wonderfully organized treasures to create with. You have the greatest ideas for storage. I did not share enough of my storage in my post this year. I quess I am still overwhelmed with all the work of the redo and losing my dog to a hit and run. There is always next year or more posts along the way. Thank you for sharing your fabulous space. It is truly one of my favorites. Happy Creating. Oh, your studio takes my breath away. It is absolutely beautiful, and the way you display everything is just lovely. You are so creative.. I don't think I could ever leave. What a beautiful studio! Amazingly organized! You are a mother of 8! Wow! I thought 4 was tough. How do you find the time to do everything? And 18 grandchildren! I can't wait to become a grandma. Wow what a great space! 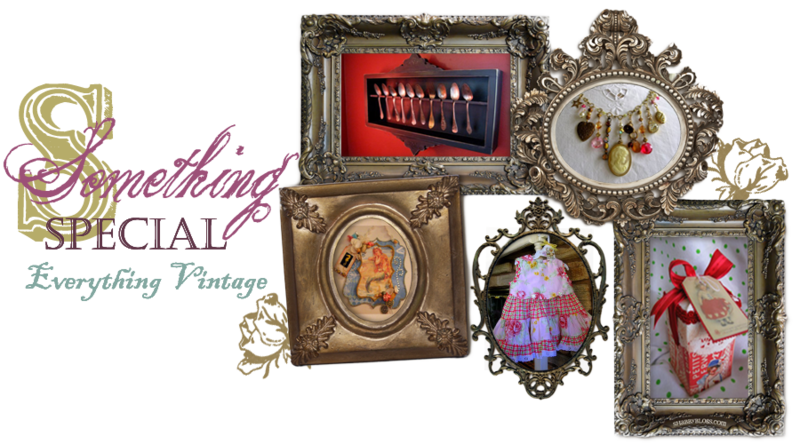 So full of vintage finds that all work so well toghter! Love the Christmas finds! Your studio is a beautiful space - I love that it is so feminine .... I'm not suprised that such gorgeous creations come forth from there. Wow, your studio is perfection!!! 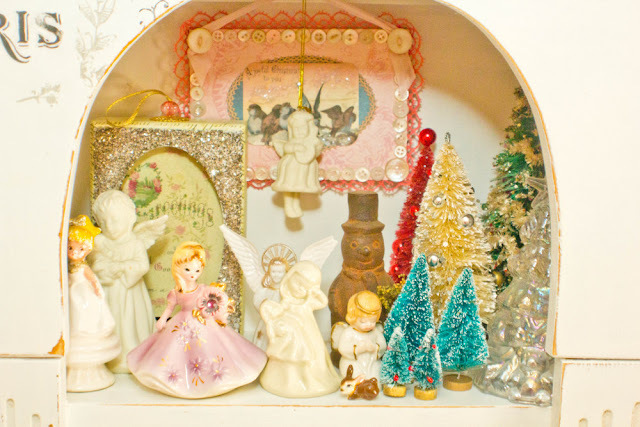 It is so organized and lovely! 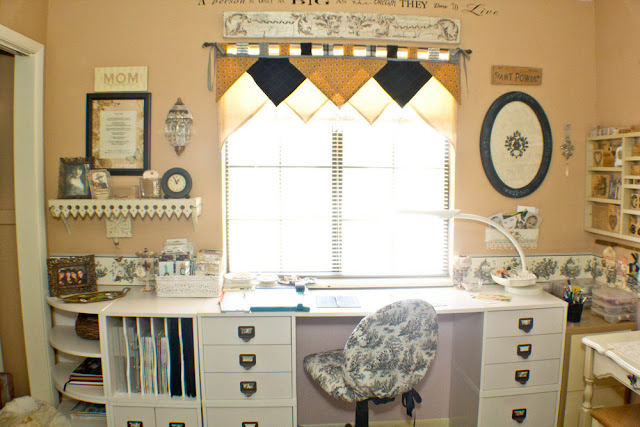 I love how you co-ordinated, then used the sewing machine drawers... you have a wonderful space! Ohhh is there room for a chair for me?? Love it! I adore your collections - especailly the buttons and lace, my two favorite things! Thank you for sharing. I LOVE your room. 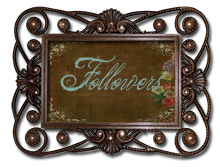 I have already gotten several ideas from you and will be following your blog. I am still looking for the perfect chair and desk for my room and I just love your chair! Did you cover it or find it that way? 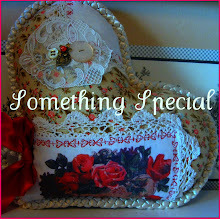 Thanks so much for sharing and for visiting my little corner. What a great room!!! Thanks for sharing!!! I love your studio, so beautiful and so many nice things. I'd love to play in your studio, it looks like we like a lot of the same things. 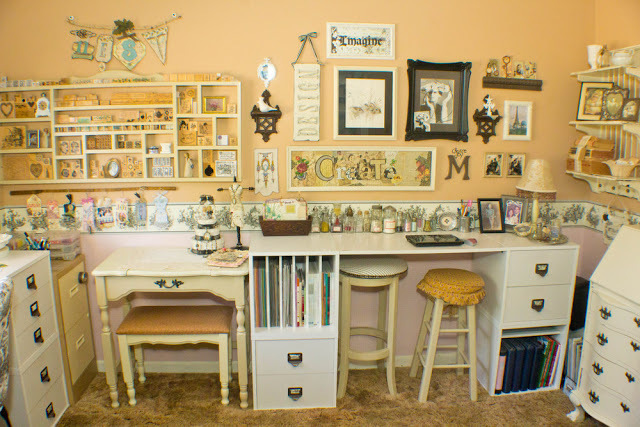 Oh my goodness - your studio space is amazing - just magical. I love your ribbon box and the shelf you designed. Spectacular studio! 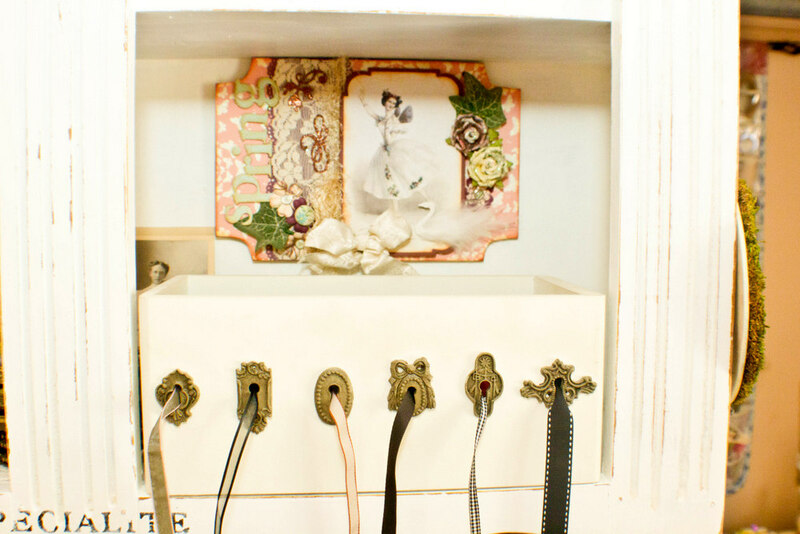 Love the sewing machine drawers filled with fiber wrapped tags and the wonderful organizer on the wall above it. So many inspirations here. Thank you for sharing. 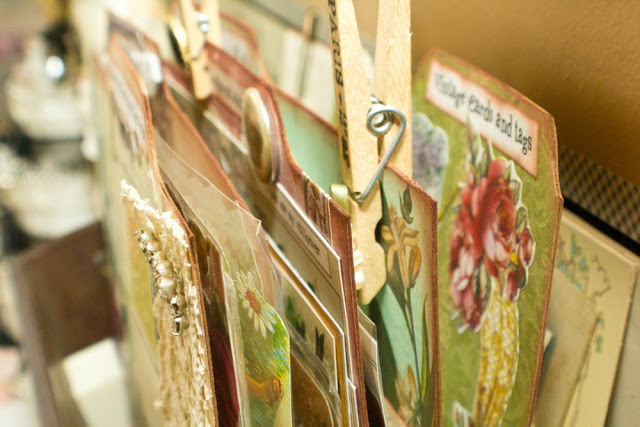 Michelle, I so enjoyed my visit to your craft room today, there is so much to admire and be inspired by. I am certainly taking a few ideas away with me. Oh my gosh what an amazing space! You have such great tidbits to be creative with. I could spend hours in there getting my craft on. Michelle.... Oh, all the goodies tucked in every corner! So much fun to take my time looking at each and every one. And what made me giddy? 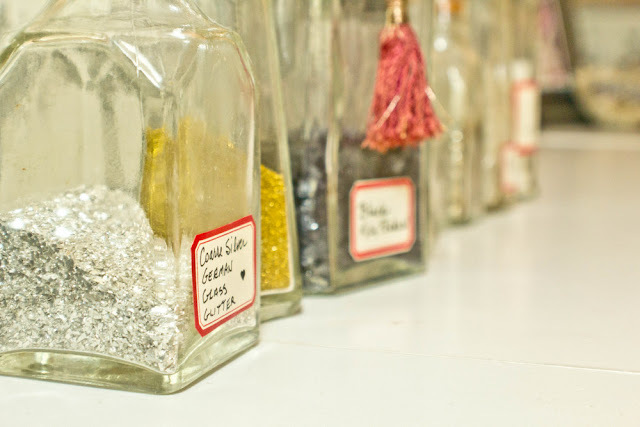 the collection of salt and sugar shakers housing your glitter! I love that! But I also loved your shop tag. Delightful! And of course, I am a sucker for button cards. Lovely studio and thanks for sharing with all of us! See again very soon!! Beautiful! Thanks for sharing! Love all the tags you make.... the pillows are darling. 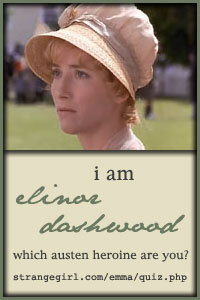 I knew I would be postitively floored by your space. WOW how I would love to see this in real time. Amazing little vignettes everywhere. Stunning really and truly. Thanks for sharing so much that is upclose and personal to you. My Magpie eye just loves all the lace and shiny bits. Keep smiling and creating PS The ribbon box is pure eye candy. 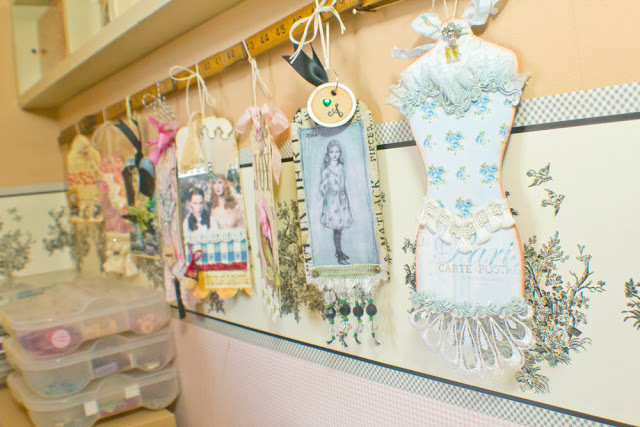 What a beautiful studio, thank you for sharing all the loveliness! Michele, your studio is so beautiful! 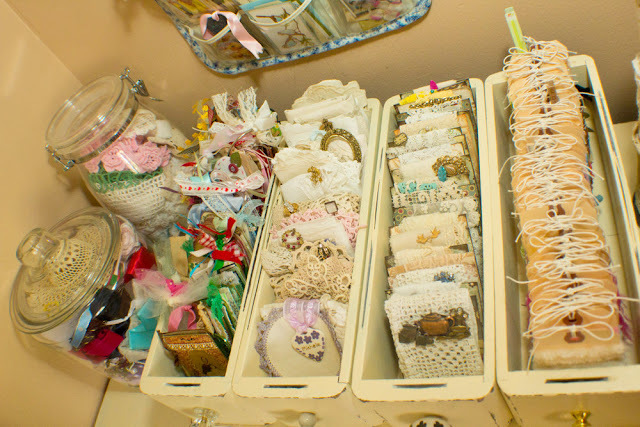 I love your ribbon/trim storage...have got to get me some sewing machine drawers. Thanks for sharing! Michell, loved your space! It's a lovely balance of creativity and organization. 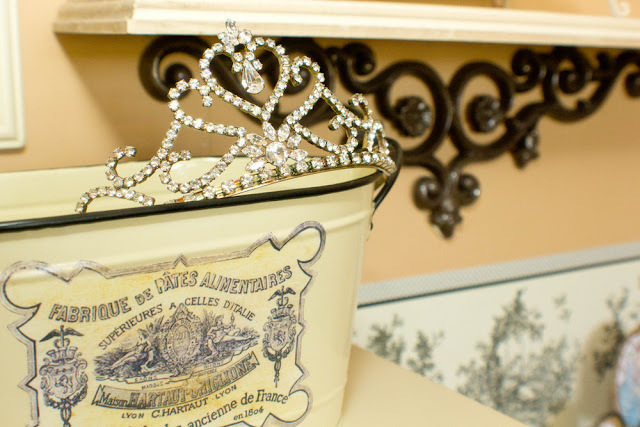 Love all the Vintage goodies! WOWZIE! Super over the top fabulous! Can I move in? 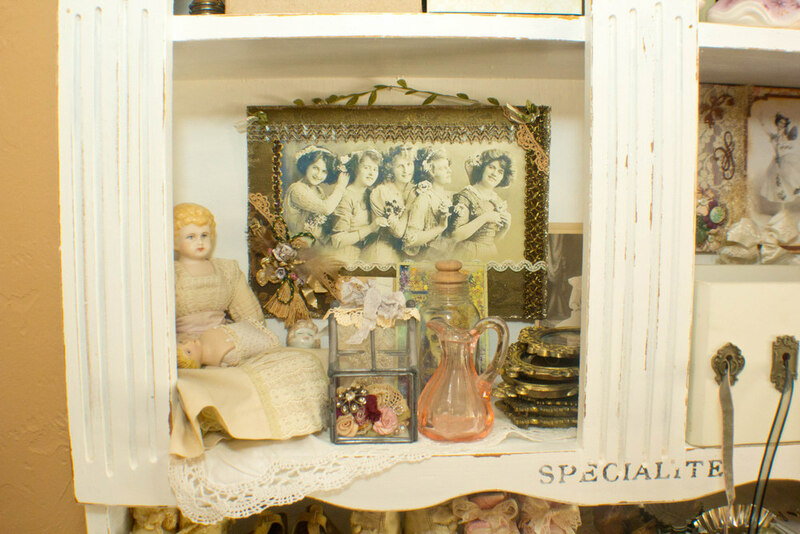 What a lovely space you have filled with all sorts of treasures! Everything here is so totally organized. 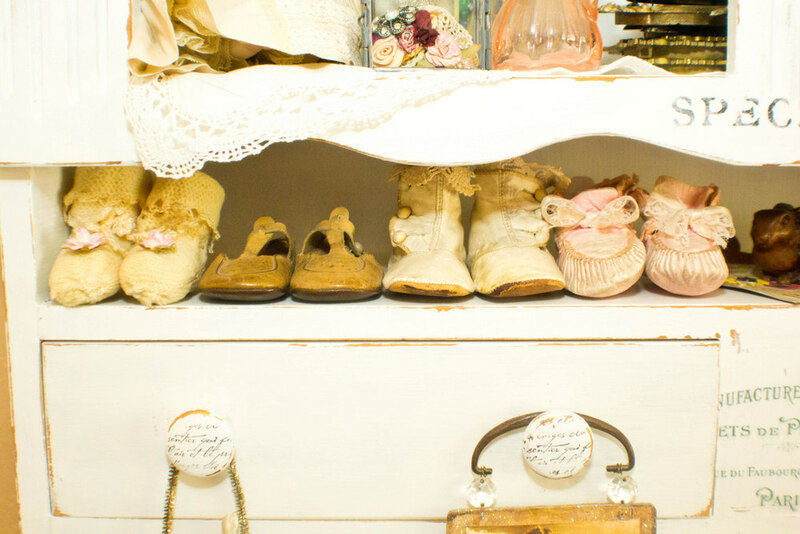 All of your treasures are displayed so beautifully like your little sewing machine drawers filled with wrapped ribbons and threads plus your shakers look gorgeous all lined up on your bench. Thanks for sharing such a welcoming space. You are so organized!! 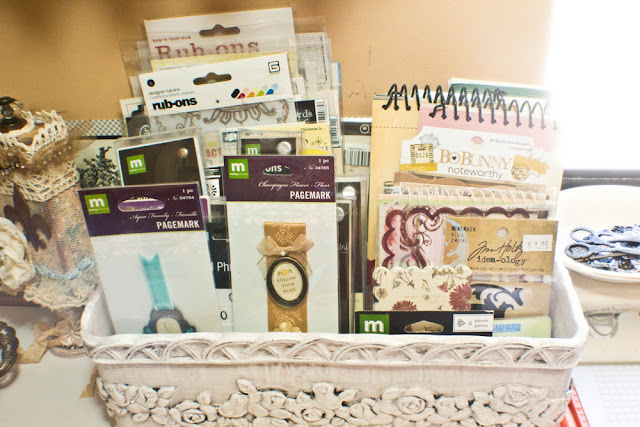 So many great ways of displaying and organizing supplies!! Thanks so much for sharing! Oh my, so many tresors to look at - I had to return once again to absorb all the eye candy. Thanks for coming by and visiting as well. Take care. Michelle your studio is one of my favorites! I had to go over the photos twice and I know I will back at least one more time!! Thank you so much for joining the party and letting us all be inspired! I love your room! It's so inviting and warm. Plus i love the organization you've done. How long did that last?? I just love the white! It makes a space look bigger and brighter. Thanks for sharing!!! You are so sweet to be visiting so many of us! I love your creative space and studio...beautiful !! An oh-so-stunning space, thanks so much for sharing it with us....!! Hi Michelle! I'm not sure where to begin - your space is so beautiful! 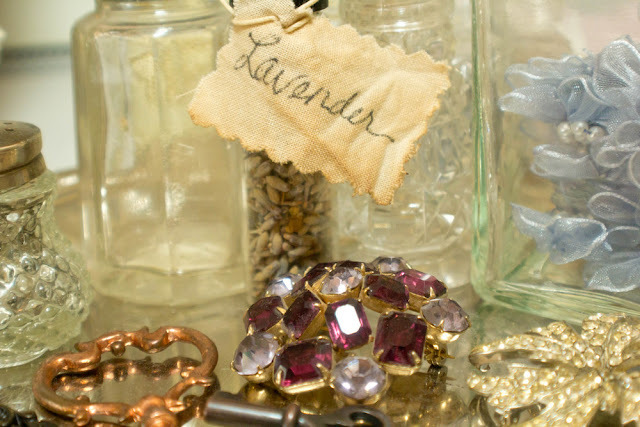 It has the perfect balance of neatness/organization and inspiring collections of beautiful stuff! 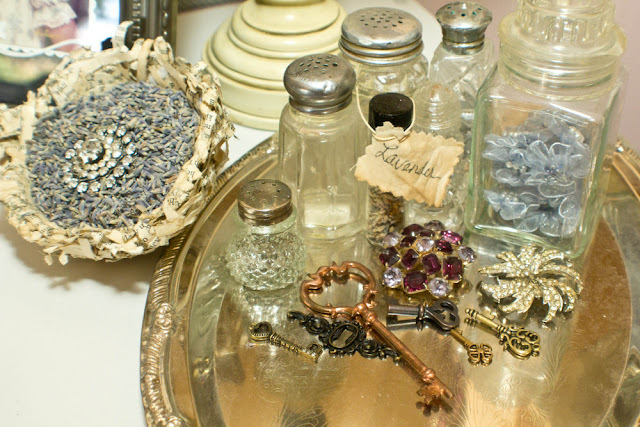 Your gorgeous supplies are beautifully displayed - truly inspirational! I'm sure it must an absolute joy to create there! Love the treasures you've created - what a talent! Thank you for inviting us all in!! And thank you for your visit to my space and your kind words! I really appreciate it! 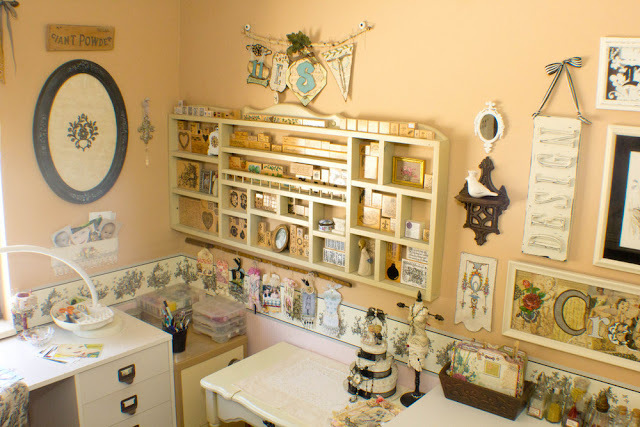 What a beautiful studio you have - I love those 4 drawers with your ribbons etc. so pretty. I could get lost in your room for days! What a beautiful and inspiring space to work in. Thank you for sharing with us. What an amazing space you have! So many things I love...I could get lost in that room for weeks! I especially like those neat little drawers where your tag cards fit. 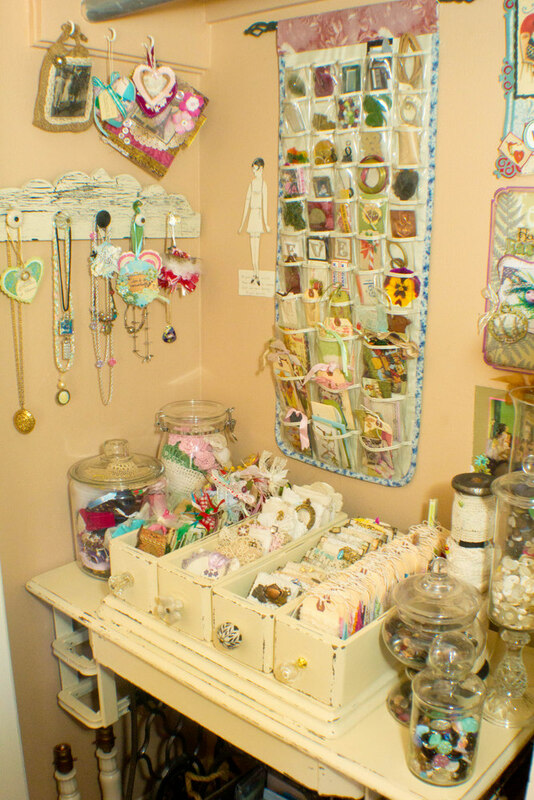 So pretty and organized! Oh my goodness, this is so lovely. You have wonderful surfaces on which to create and such lovely decorations and prettiness out to inspire you. 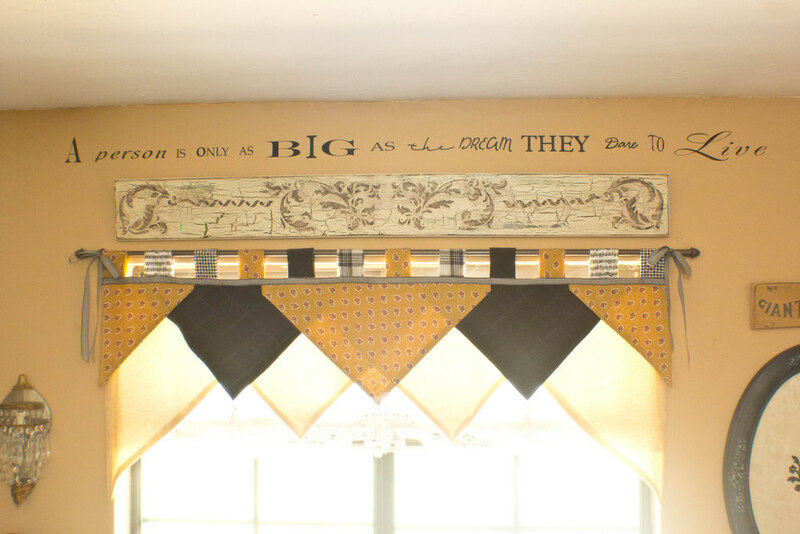 I wish I had a room like it. Thank you so much for sharing with all of us. I thoroughly enjoyed it. 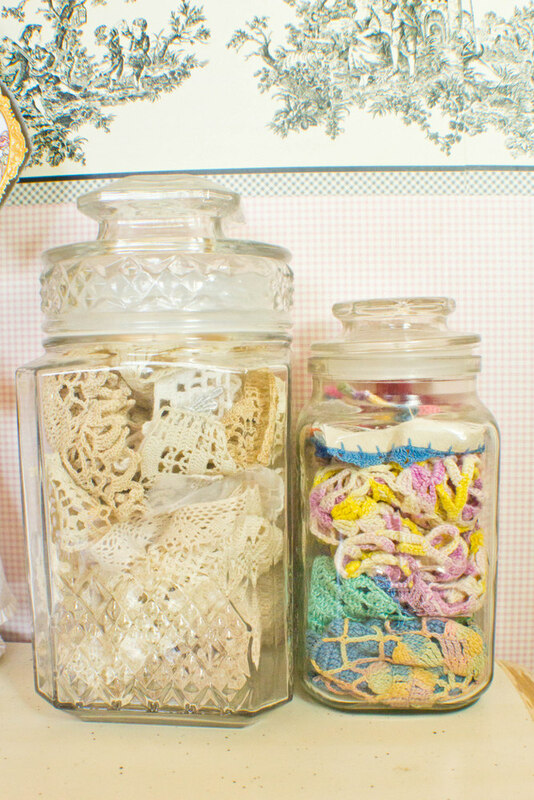 I love the way you have stored your ribbon and trimmings! Your space is just perfect! 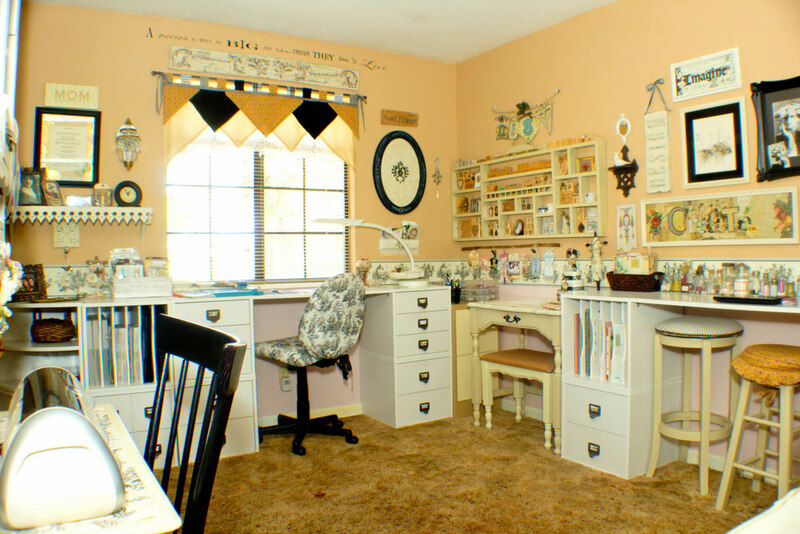 I am in complete awe of your craft room. I could never in a million years have even thought of the many uses and ideas you have in there. Midsummer Night's Dream Matchbox swap!